In memoriam for Steve Jobs as 2011 draws to a close, here’s one more rare photo that illustrates his rebellious spirit. In December 1983, a few weeks before the Mac launch, we made a quick trip to New York City to meet with Newsweek, who was considering doing a cover story on the Mac. The photo was taken spontaneously as we walked around Manhattan by Jean Pigozzi, a wild French jet setter who was hanging out with us at the time. Somehow I ended up with a copy of it. My editor begged me to include it in my book, but I was too timid to ask for permission, especially since IBM was still making CPUs for Apple at the time. The book is his “Revolution in The Valley: The Insanely Great Story of How the Mac Was Made “, which tells the story of how the original Macintosh was created. That subject was briefly discussed in the recent Steve Jobs biography as well. The picture demonstrates the competitive nature of Jobs and early Apple, and although the image has been around a while this is the first higher resolution copy to surface. In the early days of Apple, IBM was largely considered the companies biggest competitor and enemy of sorts, as is demonstrated in the Ghostbusters spoof and of course the classic 1984 Superbowl commercial that launched the first Mac. Nice pictures but i think it’s fake. It’s definitely not fake, Hertzfeld was there when the picture was taken. You can’t seriously think this is fake… it was POSTED BY Andy Hertzfeld LOL! He’s lucky he didn’t try that crap at our Yorktown facility. Lighten up… Unlessyou really have a corncob crammed up where the sun don’t shine! 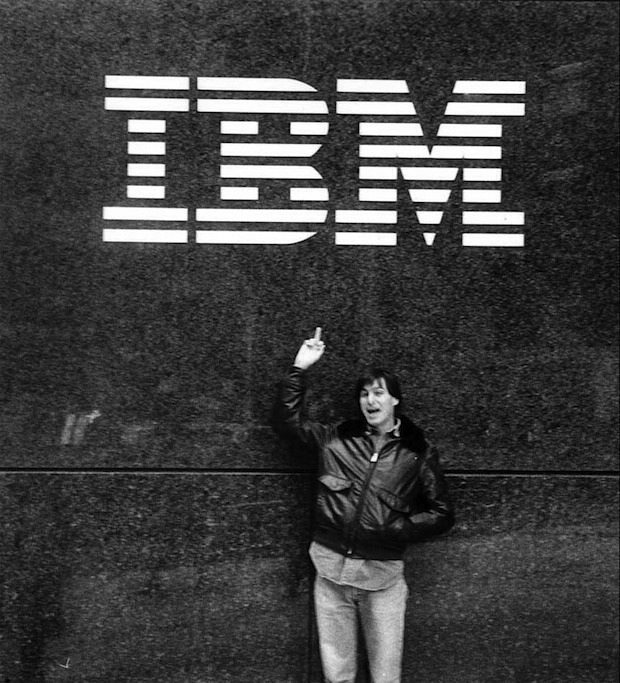 IBM probably spent more on the logo behind Steve than Steve & Steve spent making the original Apple I.